Geneseo, IL, a small town of about 6,000, has Victorian style homes and a nationally ranked school system. It is full of small town charm, but located close enough to big cites to still enjoy what larger cities have to offer. It is home to the Springfield Armory. Located just 20 miles away from the “Quad City” area, Greiner Buildings is happy to meet all pole building and post frame building needs in Geneseo, IL. 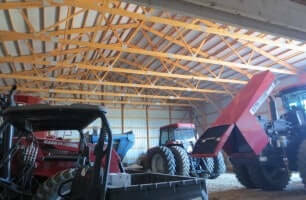 Greiner Buildings offers cold storage buildings in any size you need. These buildings are durable and attractive, requiring little maintenance after being constructed, and last for years to come. Cattle Sheds– We know how important your cattle is to your livelihood. That’s why Greiner Buildings offers custom made cattle sheds to suit all of their needs. Our cattle sheds are easily accessible, spacious and comfortable, and well insulated to keep them safe. A dry cow is a happy cow! Residential Homes: Greiner Buildings is proud to offer custom home construction for residents of Geneseo, IL. We can build anything you can dream up! Commercial: At Greiner Buildings, we offer 3D and 2D CAD designs as well as stylish and inexpensive options for all of your commercial building needs. Horse Barns: Greiner Buildings has the perfect equestrian buildings for any horse owner. Whether you need a stall barn, riding area, or stable, we can build it. We can put in hay lofts, install insulation, as well as design custom horse stalls with various different options for you and your horse. Hobby Shop Buildings: Our hobby shops are personally designed by you to fit your needs. Greiner Buildings is happy to build you a custom building to help grow your hobby or business. Insulated Shops: We install insulation in order to keep your shop and equipment safe. Your investment will be well worth it with our professionally insulated shops. Machine Sheds: Our machine sheds and agricultural buildings come in various sizes and styles according to your personal preferences and conditions. Our sheds are durable, accessible, and low maintenance. Mini Storage: A valuable asset to any business is their storage units. Greiner Buildings provides quality mini storage buildings for your commercial needs in Geneseo, IL. You won’t have to worry about the quality of your construction, because Greiner Buildings only uses the best materials on the market. We can ensure that your mini storage unit will be secure and dependable for years to come. For more information about post frame and pole buildings in Geneseo, IL, don’t hesitate to contact Greiner Buildings today. We are here to answer any questions you may have, and consult with you about the best building options for your home or business. We look forward to working with you!